A brilliant solution to man's light cord rolling problems, this quick spool DIY will save you a lot of time and stress when it comes time to take the lights down. It finally got below 100 degrees where I live (why do I live here? ), and suddenly I have Fall Fever. I was on the hunt for easy and inexpensive fall decor ideas and found this luminescent beauty, made completely out of materials found at your Dollar store or around the house. Lacy luminaires wouldn't ordinarily be my style, but when I saw the rustic burlap mixed with doilies, I stopped dead in my tracks. The contrast of lace and burlap, a canning jar and pink satin ribbon...oh baby, I can't resist that kind of craft. Over on Crafts by Amanda you'll see exactly how to put together these juxtaposed materials. Here's all you need. Who doesn’t love the twinkle of string lights? They lend oodles of atmosphere to any environment. Good News: String lights are on clearance right now! You can save some major cheese by stocking up right now. Bad News: When displayed plain and lonely, string lights tend to read a little too HAPPY HOLIDAYS! Or worse, WELCOME TO MY DORM ROOM. The twelve days of Christmas is coming to an end (what are we on now? Ten lords a-leaping? ), and your thoughts have no doubt turned from dancing sugarplums to taking down the decorations. So, we thought we'd offer a bit of help. Here's a free way to reuse some of that holiday waste, and keep your string lights in shape so they're ready to go next year. Georgia over at JunkMarket Style has got it going on. She found a hideous hanging light at a thrift store, started to walk away when the sacred lightbulb of creativity went on. Take a look at the way she restyled this (literal) piece of junk into this sophisticated Paris hanging lamp. All I want for Christmas is some extreme holiday bokeh! Though not always easy to capture (here's some tips), when one gets it right, string lights are simple some of the most amazing things to place (or not!) in one's depth of field. Gizmodo has assembled 107 beautiful photos of the phenomenon. 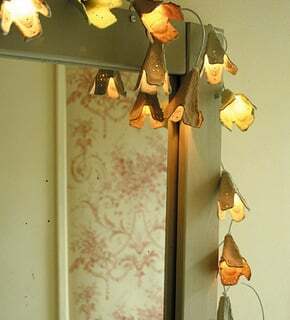 Unusual Uses: Five Fresh Ideas for Christmas Lights. Friends, it's 2009, and wrapping your holiday lights around a tree trunk and a few lower branches has simply been done. So, if you're into trying something new, check out these five ideas assembled by Diane Rixon at DIYLife. The best part is - you probably already have most of what you need to try them out. As if by synchronicity, two back-to-back Instructables offer how-tos for creating large scale chandeliers using natural elements. The second tutorial utilizes a tumbleweed and string lights for a bit more craziness. Build Your Own DIY Grow Lights. Caution! Christmas Light Safety Tips. Whether they're outside, inside, or perhaps a bit of both, Christmas lights are connected to your home circuit, and as with anything, especially those outside, you gots to be safe. Here's a few tips from Suite101 to keep the fires in the yule logs and the shocks on your face when you open the perfect gift. Some garden or jewellery wire. Wrap your wire around your light fixture, avoiding direct contact with the bulbs. If you're got unsecured electrical wires then a. don't try this and b. call your super! Sure it's super easy to change light fixtures, but sometimes you just can't. If your space is really temporary, like a dorm room or a short term let, or even if you don't have access to switch off the electricity then a refit is out of the question. Here's a few ways to deal with oogly light fixtures that won't lose you your deposit. How to turn egg cartons into flowery fairy lights. Who says cardboard egg cartons are only good for making fire starters? These sweet little flower 'shades' are actually constructed of the section between the cups themselves. All you need to make them are several empty cardboard egg cartons, a scissors, a paper punch (optional) and a string of LED fairy lights.